The Germans invented a sort of accidental flyby- wire system to control part of their Mistel flying bomb during World War II. They filled worn-out Junkers-88 bombers with explosives, and a Messerschmidt-109 or Focke Wulf-190 fighter was then mounted on top. The fighter’s pilot would steer this composite aircraft, a large three-engine biplane, to a target, aim it, and then release it to fly to the target. This was usually a dam or bridge with considerable concrete support. Junkers-88s were not commonly built with autopilots, but one was available. By placing potentiometers at the stick and rudder of the fighter, movements could be converted to electrical signals that were fed to the bomber’s autopilot. Thus one man could fly both. The difference between the Mistel and a modern flyby-wire aircraft is the presence of a computer. After lengthy use, a warplane becomes what is known as ‘war-weary’. No longer suitable for front-line operations, it can be scrapped and its materials recycled, or ‘reduced to produce’, in which case it becomes a source of spare parts. There is, however, a third alternative. It can be packed to the gills with high explosive, and crashed into a high-value target. This certainly produces a big bang, but not only is accuracy lacking, even with remote radio control from a mother ship, but the explosion tends to dissipate itself, taking the line of least resistance. In other words, much of the energy released expends itself on empty air. This was one of the problems encountered with the German remotely controlled bombs described in an earlier chapter. If they penetrated the outer shell of a warship, the effect was devastating, but, as we have seen, hits on heavily armoured warships did not guarantee their destruction. Much the same problem had been encountered in tank warfare, where guns had proved largely inadequate to penetrate the heavy frontal armour of main battle tanks. The solution was the hollow-charge warhead. This was coneshaped, with the high explosive contained behind a soft metal liner, copper for preference (though, as copper was in short supply, aluminium was often used). Detonated on impact, the explosive melts the liner and projects it forward at hypersonic velocity, cutting and burning through anything in its path, with all the energy directed linearly. 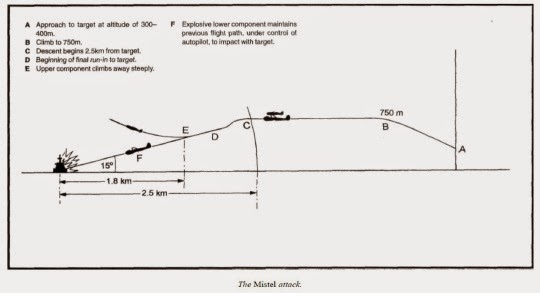 Penetration is directly related to warhead diameter and not to impact velocity, which allows hand-held infantry anti-tank weapons to be effective regardless of range. 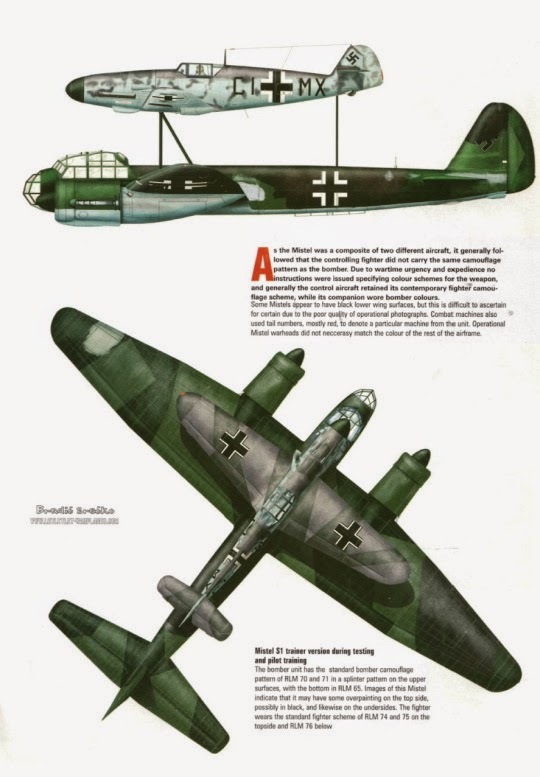 To destroy battleships, a large hollow-charge weapon looked a good bet, while the means of delivery selected was the Ju 88. The weapon tailored for it weighed 3,500kg, of which 1,725kg was high explosive-a mixture of Hexogen and TNT. 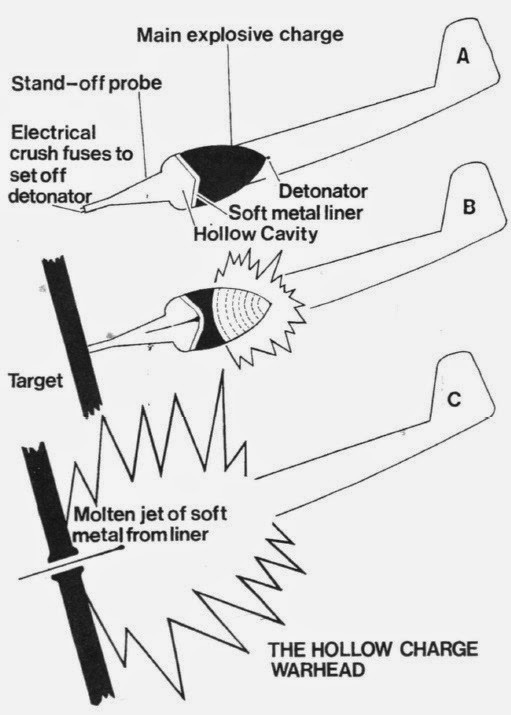 Depending on size, hollow-charge weapons need a certain distance in which to develop their full lethal effect, and this was catered for by adding a detonator in a 3m long nose probe. When triggered, this would unleash a jet of molten metal 300mm in diameter, calculated to penetrate up to 7.5m of armour-far more than was carried by any battleship in the world. In fact, during trials it actually penetrated more than 18m of concrete! 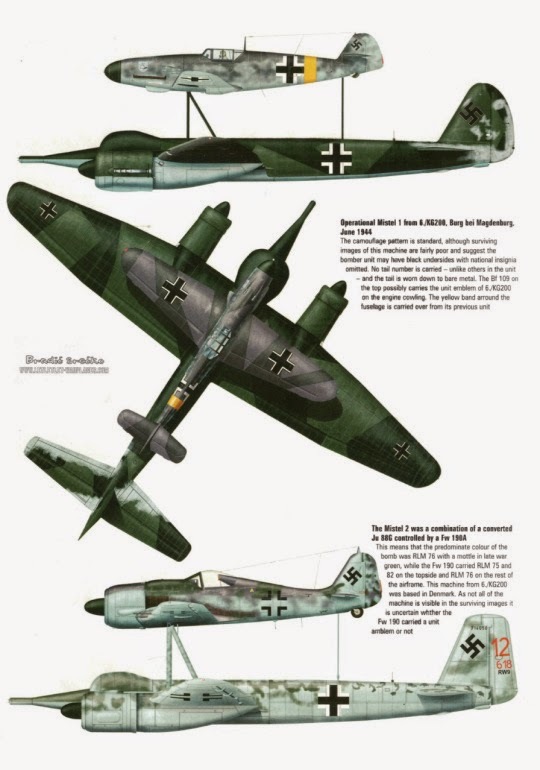 Operationally, the Mistel was flown from a single-engined fighter, either a Bf 109 or an FW 190, mounted on pylons above the Ju 88. This could release itself once the weapon had been established on its attack path, after which the pilot would quickly make himself scarce. There were, however, other needs- training missions, and the need to ferry the Mistel combination to its attack base. In theory, this could have been done by the pilot of the upper aircraft, but, in practice, judging a safe landing would have taxed his abilities to the limit. Crashing a converted Ju 88 with a hollow-charge warhead on board was not a good idea, especially given the sting-like proboscis, which, if it had detonated the weapon, would have made a mess of the runway. The solution was truly ingenious. The original crew compartment was removed and replaced by a new nose section which housed a two-man crew, with basic facilities for training missions. On training or ferry flights, both upper and lower aircraft were piloted, allowing the upper man to detach himself and land separately. The new cabin was mounted with quick-release bolts which allowed a rapid changeover to the hollow-charge nose. Final trials were completed in April 1944, and in that month the first Mistel unit, 2/KG 101, was formed, under the command of Horst Rudat. Previously a He 111 pilot and Staffelkapitän 2/KG 55 on the Eastern Front, Rudat had been awarded the Ritterkreuz on 24 March 1943. Now he applied himself to his new task. Three primary targets were considered-Gibraltar, Leningrad and Scapa Flow. Gibraltar was eliminated on the grounds that the attack would have to overfly neutral Spain. Neither was Leningrad viable, first because of the difficulty of attaining surprise and secondly because, as the Soviet Fleet was bottled up in the Baltic, little military advantage would be gained. A raid on the British fleet anchorage at Scapa Flow was meticulously planned, with the Mistels scheduled to fly out at low level, navigating using radio beacons which had been previously laid. This last was pre-empted by the Allied landings in Normandy in June, and 2/KG 101 was transferred to St Dizier in France to operate against the invasion fleet. The first attack, of four Mistels led by Rudat, took place on the evening of 24 June. It went ill. ‘Friendly’ fire knocked out the port engine of Rudat’s Ju 88, and, when he disengaged from it, it dived into the sea. Of the others, one scored a near miss against the headquarters ship HMS Frith, causing extensive splinter damage. Only about six other Mistels were launched against the invasion fleet, one of which is believed to have hit the elderly French battleship Courbet, which was used as a blockship for the Mulberry harbour off Arromanches. As this had already been scuttled and was resting on the sea bottom, it hardly counted. Then, on 9/10 August, a Ju 88 component impacted well inland near Andover, following an abortive shipping attack in the Channel. This lack of success was hardly surprising. The approach was made at low level, below Allied radar cover. On reaching the target area, the Mistel pilot would pop-up to about 750m and select a ship to attack. Having lined up on it, at a distance of about 2½km he launched into a 15-degree dive. As the range closed to 1½km, he released the bottom half of the combo and pulled away. The explosive-packed Ju 88 then continued on its former course by autopilot to impact the target. But it usually did not! Shortly afterwards 2/KG 101 was redeployed for the attack on Scapa Flow, and, with the addition of illumination and training Staffeln, was redesignated Ill/KG 66. The operation was mounted in October, but three of the five Mistels crashed and the other two failed to find the target. On 10 November Ill/KG 66 became 11/KG 200, with 6/KG 200 commanded by Walter Pilz, like Rudat previously an He 111 pilot with KG 55 in the East, who had been awarded the Ritterkreuz on the same day. The Scapa Flow operation was finally abandoned when, on 12 November, the German battleship Tirpitz was sunk by RAF bombers. With the removal of this surface threat, the target, the British Home Fleet, decamped for the Pacific. With no naval targets left, the Mistel force was next directed against the Soviet electrical generating industry in Operation ‘Eisenhammer’. In charge was bomber ace Werner Baumbach, who by now sported the Ritterkreuz with Eichenlaub and Schwerten. However, this plan was overtaken by events as the Soviet Army threatened and then overran the bases from which ‘Eisenhammer’ was to have been launched. By March 1945, slowing the Soviet advance by smashing the river bridges over first the Vistula, then the Oder, took priority. However destructive the giant shaped charge was, it was totally unsuitable for the task of destroying reinforced concrete bridges. Moreover, without radio command guidance, the system was too inaccurate. Like many other German schemes, it was simply not good enough.